Indigenous Australians are 4 times more likely to die of kidney disease than non-Indigenous Australians. Head Full of Love is the most beautiful, vibrant, straightforward storytelling you will experience all year. From the head and heart of Playwright, Alana Valentine (Run Rabbit Run and Parramatta Girls), this is an extraordinary piece of theatre and one of the most important current works in this country, in terms of art and politics marrying up to inspire social change. We’ve seen some proof of this already, with over $14 000 donated by patrons, post-show to The Purple House (Western Desert Dialysis) during the 2010 season, which saw the story of Tilly and Nessa’s unusual friendship shared with the people of Darwin, Alice Springs and Cairns. Perhaps the first step to reconciliation is friendship. 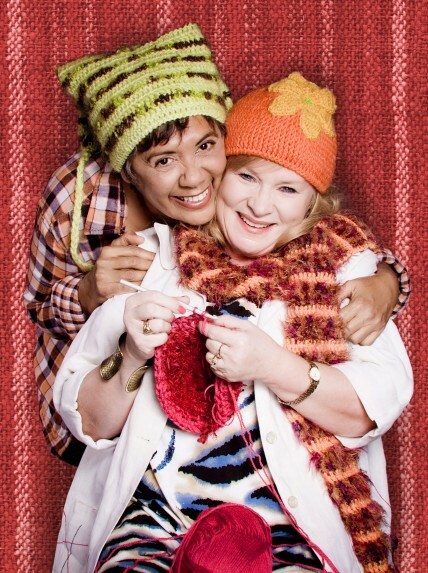 Set in the red centre during the lead up to The Annual Alice Springs Beanie Festival, Head Full of Love sees Tilly Napuljari running out of time to finish her new creation in time to enter it for judging. Nessa Tavistock, a Sydneysider, has run away to escape her own problems back in the big smoke. Their unlikely friendship helps both to heal – physically and emotionally – and challenges and inspires us to think again about what it means to be truly accepting and supportive of each other as human beings. Designer, Simone Romaniuk, has given us the harsh landscape of the outback in all its disheveled glory, with a corrugated iron backdrop (upon which the images of Tilly’s country are projected), household junk and that ubiquitous red dirt in abundance. Underneath Ben Hughes’ warm lighting design, this set is at once arresting, disarming and full of wonder. Nessa is completely out of her comfort zone and as audience members who watch the women sitting in the red dirt from the comfort of an air-conditioned, well appointed theatre, we wonder how anybody could survive in such a place! But they do. (Though some may never feel quite comfortable or local. This is a place where the nurses who assist their renal patients sleep on top of the roof racks of their troop carrier. Snakes, you know?). Composer and Sound Designer, Brett Collery, provides an evocative story behind the story and we are immersed in Tilly’s world, which is full of much more humour and light-hearted fun than we had ever expected. The scope of this piece is wide and it will catch out many who may have thought, “This is not for me.” This play IS for you. As well as the political message, which you can leave behind if the play leaves you cold – unlikely – you’ll get an evening of beautiful drama/comedy, quite unlike anything you’ve seen yet. As Director (and Artistic Director of QTC), Wesley Enoch suggests, “As Australians, we are too often ignorant of the issues facing Indigenous Australians. Telling stories that illuminate a neglected issue is an important role for a theatre company…telling stories can make a difference.” Even if you’re able to ignore the plight (who ARE you?! ), you’ll be touched by the performances of the actors; they are a couple of this country’s best. Colette Mann and Roxanne McDonald have worked with Wesley Enoch on Head Full of Love since its original co-commission in 2010 by Darwin Festival, 32” Browns Mart Producing Hub and Red Dust Theatre. This has been a wonderfully close collaboration, with the playwright, actors and director meeting people in the community to hear their personal stories first hand and it’s a perfect example of how we can create new theatre for all audiences, without leaving any demographic outside of the storytelling circle. We get it. We respond to it (those who are able to have the option to donate on the way out so if that’s you, remember your cold, hard cash for the cause) and we leave the theatre wondering why there isn’t more being done. Theatre has long been about news delivery and political change. The nuances with which this story is told balance its boldness, the characters are beautifully juxtaposed and the subject is explored to within an inch of its life without any of us feeling as if we are being preached to. Head Full of Love opens up topics of conversation that we have all been wary of discussing. But that’s dispelled with Mann’s opening lines, which ponder the need to say sorry to Tilly! It’s hilarious and touching material. This work explores so many important issues (and encourages us to see the humble beanie in a whole new light! ), that you’ll be questioning everything you believe being Australian means. Patrons created some of the amazing beanies you see on stage and in the foyer. After the season closes, these beanies will be donated to families in need, through St Vincent de Paul’s Hope House.